Kawakawa Bay is on the northern shores of Lake Taupo 5kms west of Kinloch. Kawakawa is a great place to come and learn the trade. camp, there is a grassy campsite 50m up the beach from the long drop. Hex = A set of Hex’s. Kawakawa Bay - Re bolted. 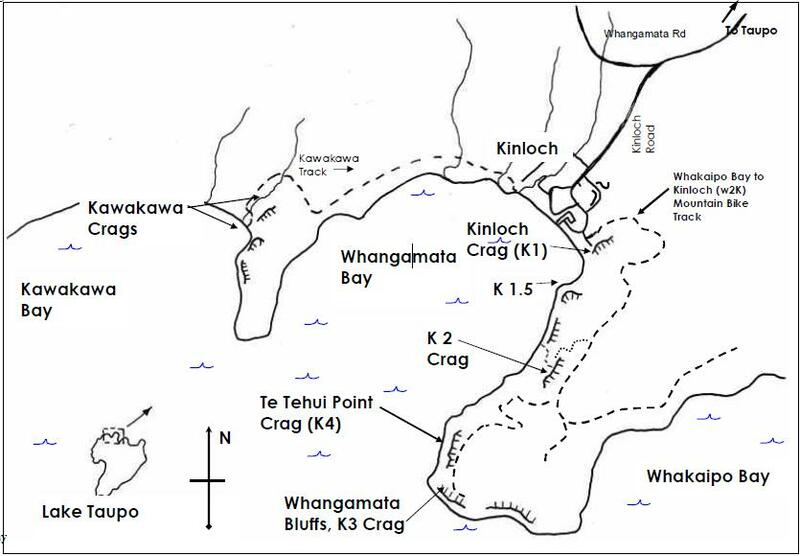 In August 2007 Steven King, John Pellew and co, rebolted Kawakawa Bay. Kawakawa, great effort, fantastic Crag. Thanks Cliff. www.freeclimb.co.nz. NZAC download, Written by Stephen King & Cliff Ellery- Guide Update Feb 2013 by Rob Addis, Dan Head, Gerard Tarr.